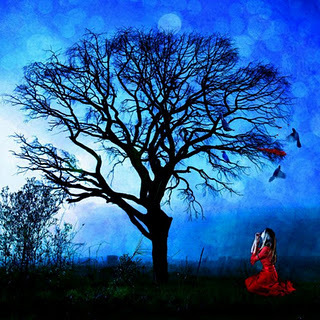 The lady in red waits beneath the gnarled old tree, sure her love will return one day. The lady in red listens for his voice on the wind, sure she will hear it in time. The lady in red watches the sky for his graceful glide; sure she will see it on the horizon. He’d vowed to love her beyond his very last breath. He would be her champion in this life and onward into death. The lady in red worries upon her knees, troubling is his late arrival. The lady in red weeps among the leaves, firmly entrenched—deep in denial. The lady in red withers below the branches, fearful he is lost to her. She vowed to love him beyond her very last breath. She would be his haven in life and in death. The lady in red acknowledges the swift setting sun, their timing long gone. The lady in red feels the oncoming change, their places to switch with nary a hitch. The lady in red resolves to accept her fate, the moon once again rearranged the mates. They vowed to love beyond their very last breath. Be they in fur, or in feathers—in life or in death. To view more story slams or join in the fun visit Bluebell Books. Thank you for yous share. You're welcome, Wander. Thanks for stopping by! Wonderful write. I like it! lovely imaginations, thanks for sharing. Enjoyed reading this, but it was sad and brought a lump to my throat. Thanks for sharing. Blessings! This got me quite emotional, such precious vows.